Obama Administration Decides Consent Of Patients Not Needed To Study Their Blood, DNA : Shots - Health News In its update of ethics rules aimed at protecting patients, the Obama administration decided against a provision that scientists said would hinder research. Consumer advocates aren't happy. 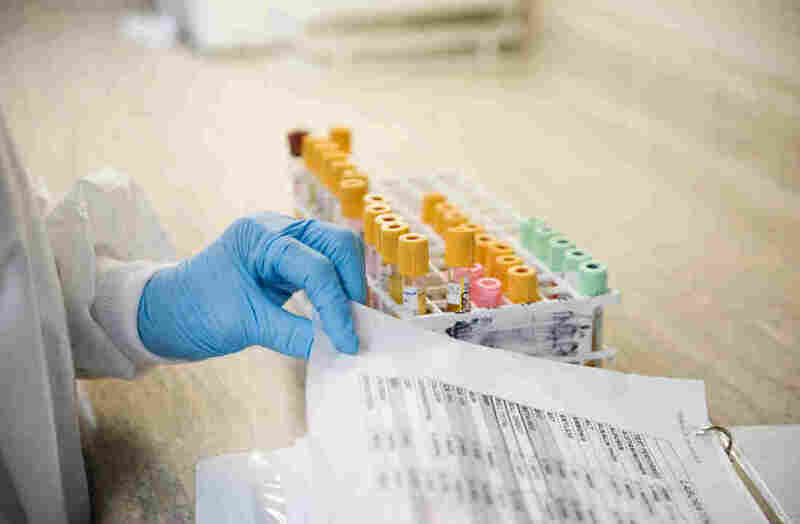 Some ethicists and consumer watchdog groups worry that the newly revised federal rules governing medical research don't go far enough to protect the rights and privacy of patients. The Obama administration has dropped a controversial proposal that would have required all federally funded scientists to get permission from patients before using their cells, blood, tissue or DNA for research. The proposal was eliminated from the final revision of the Common Rule, which was published in the Federal Register Wednesday. The rule is a complex set of regulations designed to make sure federally funded research on human subjects is conducted ethically. The revision to the regulations, set to go into effect in 2018, marks the first time the rule has been updated in 26 years. The initial proposal that researchers be required to get permission before using a patient's tissue sample for research came out of the desire to avoid repeating what happened to Henrietta Lacks, an American who died of cervical cancer in 1951. Some of the cells from Lacks' cancer were kept alive for decades, used in research and for commercial purposes without her consent or her family's knowledge. But scientists have argued that the mandate for consent in the initial Obama proposal was unnecessary and would hinder crucial research. "That proposal received a lot of criticism," says Dr. Jerry Menikoff, who heads the Health and Human Services Office of Human Research Protections, which announced the final decision. "There was concern," he says, "that by implementing this new rule it would be harmful to the research enterprise, because it would make it harder to do research that is very, very useful." The final decision was welcomed by scientists and universities. "We are very pleased," said Mary Sue Coleman, a biochemist and president of the Association of American Universities. "It would have been an unworkable system. Every time you have to get consent, it adds costs and complexity to the system that would have affected millions of samples — and, we think, would have limited research." Still, the decision to drop the requirement raised concern among others. "We know that trust is a critical factor in folks participating in research," says Debra Mathews, a bioethicist at Johns Hopkins University. "And we've seen in recent years the impact of when that trust is breached. In order for the public to trust the scientific community, the scientific community has to demonstrate that it's trustworthy. And a big part of that is asking permission." Rebecca Skloot, a journalist and author of The Immortal Life of Henrietta Lacks, a popular 2010 book on Lacks, says the many readers she's talked to over the years were taken aback by what happened to Lacks and her family. "One of the most commonly asked questions," Skloot says, "is, 'this couldn't happen today, right? They couldn't just take cells from people without their knowledge and use it in research?' My answer to that question is, 'Yes, this happens all the time.' And people are always shocked by this." "Research has been changing in the way it takes place over the last quarter century," Menikoff says. "The type of research we do is different." Big, multi-institution studies are much more common now, he says, and that calls for standardizing techniques and practices. "The notion was: 'Let's change the way we protect research subjects to fit with the type of research we do now.' "
Most of the changes included in the revision were welcomed by scientists, including one that would require studies conducted at multiple locations to be overseen by a single, central ethics committee (with certain exceptions). Until now, it's been common for each location to have a separate oversight panel. "The bottom line," Menikoff says, "is the trial has to be conducted the same way across all those sites to be scientifically valid. Therefore, the ethical analysis of the study should be consistent across all the sites — it doesn't make sense to have a separate ethical analysis at each site." But that change raised concerns among some. "The concern is that there may be inadequate protection for the subjects of the research at a particular site," says Dr. Michael Carome, who heads Public Citizen's Health Research Group, a consumer watchdog group. He and others argue there could be important cultural differences and other factors that vary among research subjects from site to site that require local oversight. "They might have unique vulnerabilities in terms of their education level," Carome says. "Or they might be non-English-speaking subjects. And if there is only an English version of the informed consent form, that could lead to the subject at a particular institution not fully understanding the risks and the benefits." The growing use of blood and cells to do genetic research also raises the possibility that the identity of the donors of those samples of blood and cells could be revealed inadvertently. The new rules will be phased in over the next several years. An earlier version of this story suggested that the revised Common Rule will allow multi-institution studies on humans to be governed by a single, central oversight committee. In fact, the revised rule requires such studies to rely on a central oversight committee, with certain exceptions. Also, to clarify, the Common Rule applies to federally funded research on human subjects, not just federally funded medical research.